After months of anticipation and multiple YouTube clips on the Star Wars YouTube channel, “Star Wars Rebels” finally kicked off this past weekend. 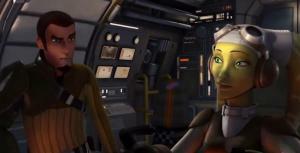 With “Star Wars Rebels: Spark of Rebellion”, an hour-long special, having been shown on the Disney Channel on Friday, Star Wars is now kicking off its fifth-ever television show. 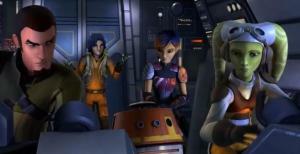 “Spark of Rebellion” greatly succeeds in accomplishing what seems to be its primary aim: establishing a sense of the rapport, camaraderie, and interpersonal relationships amongst the crew of the ship, Hera, Kanan, Sabine, Zeb, and Chopper in the light of possibly acquiring a new young kid, Ezra. Immediately apparent is the animosity that Zeb has towards Ezra, although the other crew members seem to take a liking to him, especially Hera, in a sort of friendly aunt way. 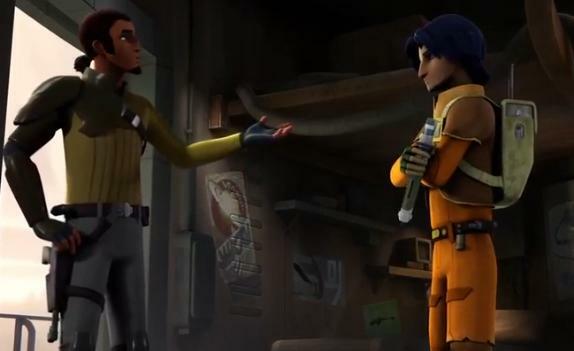 Ezra is the central character in “Spark of Rebellion”, a street-wise teenager who knows how to thieve, especially from The Republic, and finds that, in the course of trying to acquire some things for himself, runs into the aforementioned crew, who take him in. Most of the episode is about what Ezra does and how the crew interacts and reacts to him. 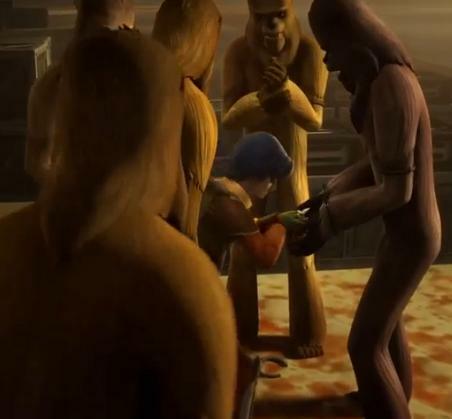 It is also about how Ezra reacts to these totally different situations than he has faced (especially when he realizes that he is in outer space “I’m, I’m…in space!”, seemingly something he has never experienced), whether on a mission to the space station, but primarily in his reacting to helping the Wookiees. It’s clear that he wants to be involved, initially, we see this when he goes to warn the fellow crew members on the space station when their transmission signals are being jammed. We also see this at the end, when he gets dropped off at his planet and is offered a bigger experience than just stealing things from the Republic on his home planet and being resigned to staying on that planet for the rest of his life. A couple of times, we hear of crew members comparing Ezra to a younger Kanan, such as when Kanan is telling Hera about the kid and she replies: “Very creative; sounds like someone I used to know”, clearly referencing Kanan and when Zeb tells Kanan: “Hey, I think you inspired the kid into doing something like you would do.” Not only are these references to a younger Kanan intriguing [about Kanan’s past and his maturing], but they also point to Ezra being capable of more than just a “street rat”, in Kanan’s words. 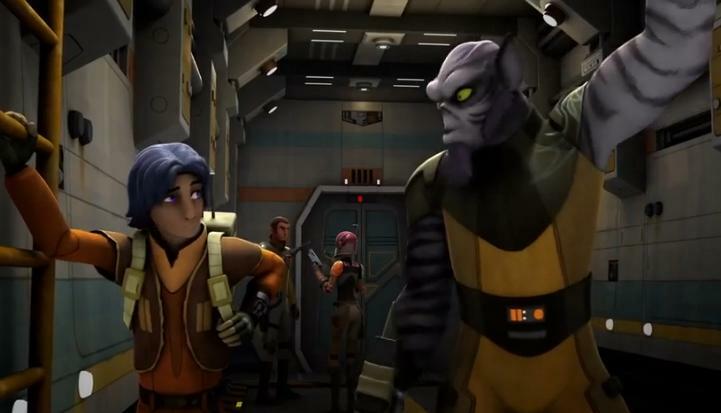 By the end, one can tell that everyone, to varying degrees has begun to accept Ezra and begun to take a liking, even Zeb does, even if he’s not willing to admit it. And Ezra, himself, has changed. Previously, he was only looking out for himself. By the end, he is helping out not only the others on-board the ship, but happily helping the Wookiees. It may be the first of many changes in young Ezra’s development. Kanan reveals himself to be a Jedi, which is, apparently, a very rare occurrence to be found in that time. 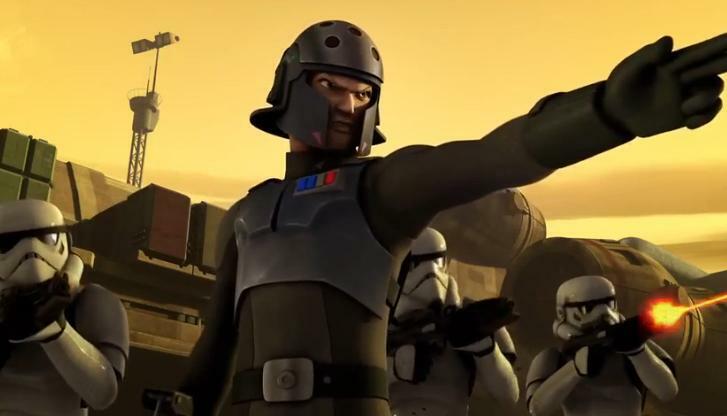 Agent Kallus is callous (he kicks a trooper toward the end (“First Jedi you’ve ever seen, sir”, to which Kallus responds with a swift kick to the helmet, sending the trooper down, perhaps to his death)) and dangerous. He is also very concerned about rebellious activities (“The Imperial Security Bureau pays attention to patterns. When the Empire’s operations are targeted in an ongoing basis, it could signify more than just the theft of a few crates. It could signify the spark of rebellion. Next time they make a move, we’ll be waiting for them to snuff out that spark before it catches fire.”) and alerts the Inquisitor to the possible presence of a Jedi. While the crew seem just like thieves, stealing from the Empire, it is revealed that they are benevolent, as we see them providing food, supplies, and more to needy folks. I very much look forward to the first season of “Star Wars Rebels”…. Kanan Reveals Himself to be a Jedi [Star Wars Rebels: “Spark of Rebellion”] Darth Vader-Inquisitor Scene Added to Prologue Version of “Spark of Rebellion” A Proper Introduction to the Inquisitor How Does “Star Wars: Droids” Fit with “Star Wars Rebels”? 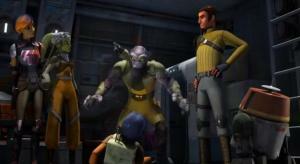 Next How Does “Star Wars: Droids” Fit with “Star Wars Rebels”?